These contact information dispensers for promotional use boost sales by encouraging customers to stay in touch with a company or store long after they leave the venue. 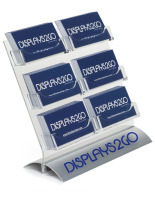 These gift coupon organizers are easily accessed by prospective clients and visitors who can see the front of the items clearly before they browse, increasing the ease with which they can find what they are looking for. 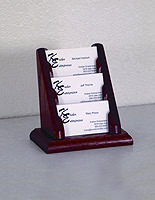 These information dispensers for business card storage have six pockets, each sized to display a stack up to 1/2" thick. 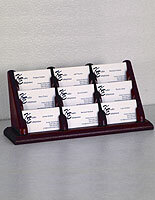 The card holders can store approximately 180 contacts, a huge lot of information, without encroaching too much on work space. 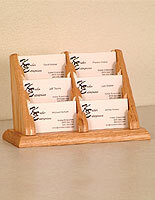 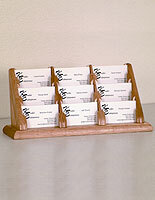 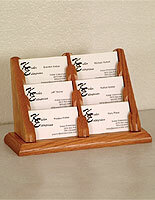 These solid oak dispensers for callingcards with mahogany finish are typically seen on a desktop at a bank or in a retail store for client or patron use.